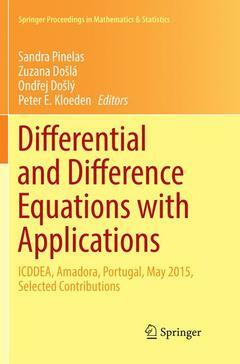 Coordonnateurs : Pinelas Sandra, Došlá Zuzana, Došlý Ondřej, Kloeden Peter E.
Aimed at the community of mathematicians working on ordinary and partial differential equations, difference equations, and functional equations, this book contains selected papers based on the presentations at the International Conference on Differential & Difference Equations and Applications (ICDDEA) 2015, dedicated to the memory of Professor Georg Sell. Contributions include new trends in the field of differential and difference equations, applications of differential and difference equations, as well as high-level survey results. The main aim of this recurring conference series is to promote, encourage, cooperate, and bring together researchers in the fields of differential & difference equations. All areas of differential and difference equations are represented, with special emphasis on applications. Algebraic Properties of the Semi-Direct Product of Kac–Moody and Virasoro Lie Algebras and Associated Bi–Hamiltonian Systems.- Analytical-Numerical Solutions for First-Order Periodic Boundary Value Problems Using the Reproducing Kernel Algorithm.- Existence of the Mild Solutions for Nonlocal Fractional Differential Equations of Sobolev Type with Iterated Deviating Arguments.- On Source Identification Problem for Telegraph Differential Equations.- On a One Equation Turbulent Model with Feedbacks.- On Stationary Solutions of Kdv and mKdv Equations.- A Filippov Type Existence Theorem for Some Nonlinear Q-Difference Inclusions.- Complex-Valued Fractional Derivatives on Time Scales.- Uniform Stabilization of a Hybrid System of Elasticity: Riesz Basis Approach.- Monotone Iterative Technique for Systems of Nonlinear Caputo Fractional Differential Equations.- Oscillatory Solutions of Boundary Value Problems.- An Issue About the Existence of Solutions for a Linear Non-Autonomous MTFDE.- Magnetohydrodynamic Flow of a Power-Law Fluid over a Stretching Sheet with a Power-Law Velocity.- Existence of Mild Solutions for Impulsive Fractional Functional Differential Equations of Order a2 (1;2).- Nonlinear Dynamical Systems in Modeling and Control of Infectious Disease.- Analysis of Difference Approximations to Delay Pseudo-Parabolic Equations.- Oscillations of Delay and Difference Equations with Variable Coefficients and Arguments.- On Asymptotic Classification of Solutions to Nonlinear Regular and Singular Third- and Forth- Order Differential Equations with Power Nonlinearity.- Some Properties of a Generalized Solution for 3-D Flow of a Compressible Viscous Micropolar Fluid Model with Spherical Symmetry.- Nonoscillatory Solutions of the Four-Dimensional Neutral Difference System.- Comparison Theorems for Weighted Focal Points of Conjoined Bases of Hamiltonian Difference Systems.- Interpolation Method of Shalva Mikeladze with Following Applications.- Parabolic Obstacle Problem with Measurable Coefficients in Morrey Type Spaces.- Chebyshev Spectral Approximation for Diffusion Equations with Distributed Order in Time.- On Polarization Dynamics in Ferroelectric Materials.- On a Discrete Number Operator Associated with the 5D Discrete Fourier Transform.- Finite Difference Formulation for the Model of a Compressible Viscous and Heat-Conducting Micropolar Fluid with Spherical Symmetry.- An Optimal Control Problem in Mathematical and Computer Models of the Information Warfare.- Forward Attractors in Discrete Time Nonautonomous Dynamical Systems.- Asymptotic Stability Regions for Certain Two Parametric Full-Term Linear Difference Equation.- Limit Point Criteria for Second Order Sturm–Liouville Equations on Time Scales.- Continuous Dependence of the Minimum of a Functional on Perturbations in Optimal Control Problems with Distributed and Concentrated Delays.- Existence of Positive Solutions for a System of Fractional Boundary Value Problems.- Reid's Construction of Minimal Principal Solution At Infinity for Linear Hamiltonian Systems.- On Numerical Regularity of Trisection-Based Algorithms in 3D.- A Non-Classical and Non-Autonomous Diffusion Equation Containing Infinite Delays.- On a Weak Solvability of a System of Thermoviscoelasticity of Oldroyd's Type.- Well Posedness and Spectral Analysis of Hyperbolic Volterra Equations of Convolution Type.- Difference Equations and Boundary Value Problems.- Discrete Dirac-Kähler and Hestenes Equations.- A Remark on the Fractional Step Theta Scheme for the Nonstationary Stokes Equations.